Free vintage Community Cycling Center t-shirt with any purchase or donation over $5. Sizes and supplies limited. The Community Cycling Center is cleaning out their current storage space in an effort to raise money during the sale to support phase one of the build out of their new workshop – a space that will be dedicated to future programs that broaden access to bicycling and its benefits for underserved communities. Additionally, the Community Cycling Center is looking for 1,500 sq. feet of storage space to house donated bikes and outreach supplies for their programs. Their current storage space’s lease is expiring in October, a space that was generously donated to the nonprofit for many years. 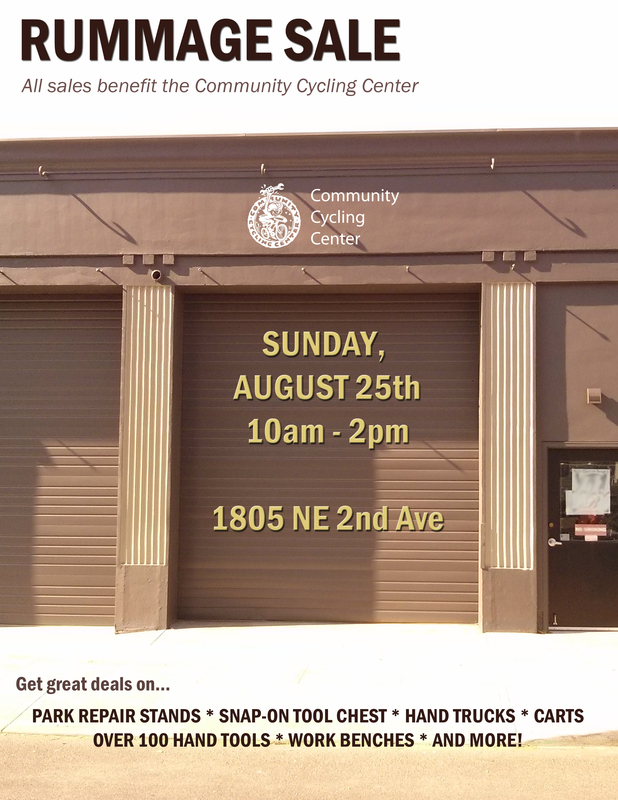 The Community Cycling Center is looking for free or low-cost storage. As a 501c3 nonprofit organization, your donation of storage space to the Center may be eligible for a tax deduction.